Studio located at 128 Oak Street East, North Bay, Ont. Come see the beautiful work of some of our members! 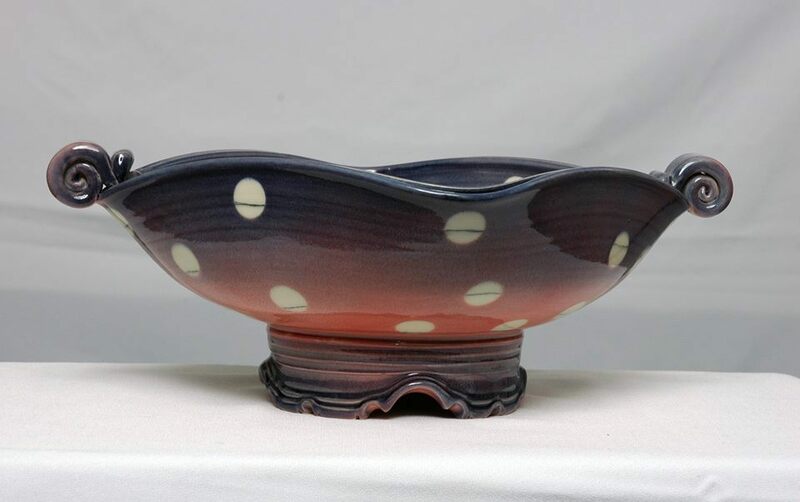 Purchase a unique ceramic piece as a gift or for yourself. Members, there will be one firing mid-month and one near the end of the month. Please have your work on the shelves. If there is not enough work for a firing it may be another 2 weeks. We aim to load, but cannot always accommodate pieces in the order that they arrived on the shelves.=== If you are interested in developing your ceramic art practice or simply want to try your hand at creating pottery for the first time, check out our Courses in Clay.=== Click here to find out more about Potters Guild members, their work and how they came to love clay and ceramic art. === Find out more about how to join our group and where our gallery and studio is located in beautiful downtown North Bay, Ontario. === The Ontario Arts Council NECO Community Futures Development Northern Ontario Heritage Fund Ontario Seniors Secretariat === NEWPAGECONTENT === After it became clear that the ceramics course at Canadore College was terminating, a large group of local potters convened. The potters were enthusiastic to have a guild established. From that point forward a seven person board was created. Meetings were held, grants were written and locations were investigated. With the support of equipment and materials from Canadore College, donations from local potters and fund raisers supported by the community at large, the North Bay and Area Potters’ Guild was created. It took two years and much expertise from dedicated potters and community members to move this forward. 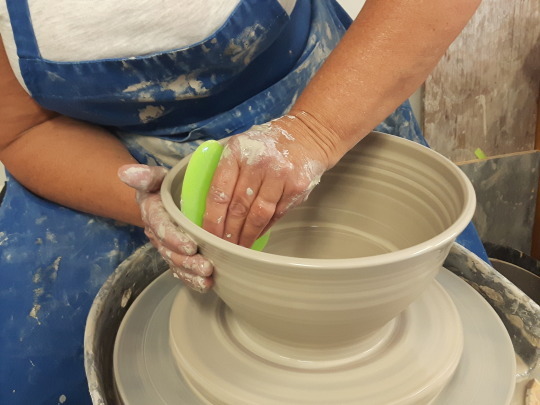 This beginner's wheel throwing class will provide you with the fundamentals of working with clay and throwing on the wheel. The class is capped at 8 participants and all students must be 16 years of age or older. This fun and casual 2-part workshop covers essential hand building techniques for creating both decorative and functional pieces. You will learn how to use slabs, molds, coils, handles, decorative effects and more to create bowls, cups, platters or decorative objects. This is meant to be a casual workshop where we like people to come prepared for an afternoon of lighthearted fun! Your end result can be a platter, canoe, mug, bowl, it doesn't matter! Come play and create with Betty and Mary! Are you interested in attending classes or workshops and wish to be contacted when new classes are scheduled? ===We offer Several Different Memberships to cater to your needs! === At our new location at 128 Oak Street in downtown North Bay, we opened a fully-equipped ceramic studio and small shop. Below is a list of the services and equipment we offer our members and workshop participants. KILNS - Our brand new KILN is one of the largest in the region. It is energy efficient, easy to load and very reliable. 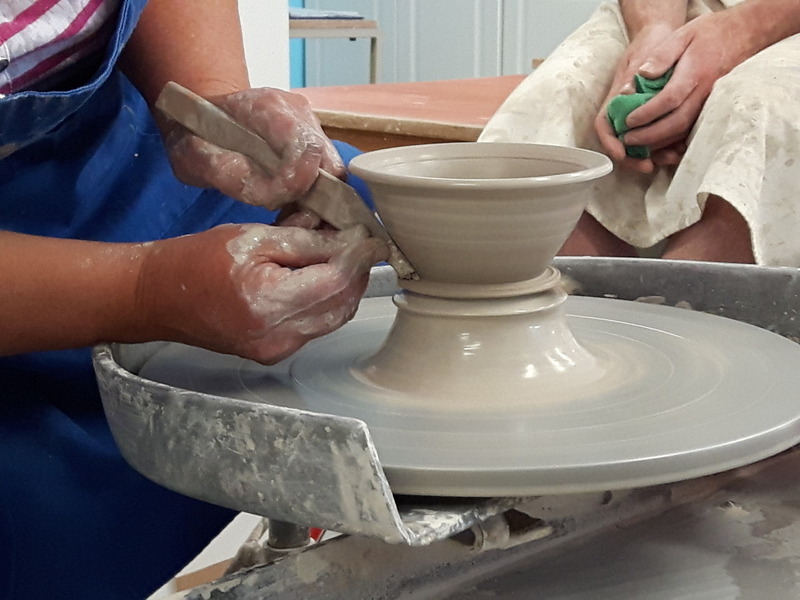 The kiln is available full-time to our Full-time members. Pottery Wheels - We have a total of nine pottery wheels at the North Bay and Area Potters Guild studio site. Our thanks to the following agencies who have supported the ceramic arts in our community.